Let’s assume you’ve already devoured every Docker 101 tutorial for breakfast. You’re now ready to take that brilliantly crafted application into production. But wait… first you need to test your container-based microservices architecture. What does the whole DevOps workflow look like? What about performance and security? And last but not least, how do I run my microservices in production, and will it scale? In this blog post, I’ll be explaining what a proper Docker workflow looks like and how to manipulate it to make it your own. I’ll guide you through the entire Docker development process, test your microservices architecture, and run your app in production on the cloud provider of your choice using Cloud 66 and the new Codeship Docker platform. To wrap things up, I’ll also show you how to scale your app to greater heights. To kickstart the process, first we’ll need a microservice to get started. Let’s create a simple API to store cat names in a MySQL backend. We know that normally you wouldn’t want your microservice to talk directly to a database. I too am a fan of loosely coupled services! But for the purpose of today’s tutorial, let’s park the conversation around loosely coupled services and containers for another blog post. Now back to the cats. The node.js app can be found on GitHub. Please clone it onto your local dev machine, check out the source, and see how the project is structured. I’m using the BDD way of testing. Every microservice exposes a contract/software interface, which can be tested from the outside-in. For the node.js test, we use the Mocha framework for running tests. For those with a Ruby background, you see the similarity with rspec. From an outside-in test approach, all I care about is whether the implementation can provide us with a stable, secure, scalable, and high-performance microservice. 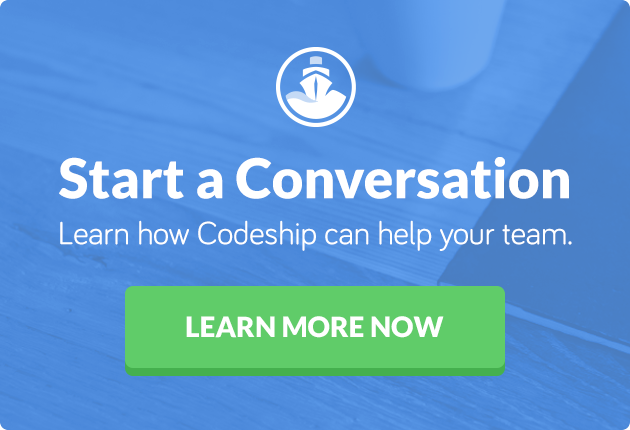 Here’s an overview of what a developer workflow will look like using Codeship and Cloud 66. Build all container images for the Cats API, test and notify service. In the end, only the API will be deployed to production. Run the Cat API microservice and start the dependencies the service relies on. MySQL in this case. Wait for those two guys to warm up. NOTE: You’ll never know how long it takes for a service to boot. Make sure to check if a service is running before making calls. Check this generic wait script. Run the test service against the Cat API when everything is up and running. Notify your Docker stack managed by Cloud 66 using the notify service to deploy the new Cats API when the tests are green. So now you’re ready to rock. Let’s try this out! The best way to get your microservice architecture built and running on your local dev system is by using the Compose (docker-compose) tool. Compose is a tool for defining and running multi-container Docker applications. With Compose, you use a Compose file to configure your application’s services. Then by using a single command, you create and start all the services from your configuration. That’s it. You’ve tested the Cats API service. Take a look at our docker-compose.yml. What you want to remember is that only the ==api== service will be deployed to the production stack managed by Cloud 66. The rest of the services are for local development and testing and will be running on Codeship Docker. You notice we use an alias for our links. By linking the containers in our local and test environment this way, we don’t need to change the code finding the services. Depending how the service discovery is implemented on your Docker cluster, using a DNS-based service discovery is a great bet. Let me make something clear concerning working with images. The API image is the same in dev = test = staging = production. Treat the image in each step the same. Only the database name may change, because you don’t want to lose any data. Nice! Does it run on the new Codeship Docker? 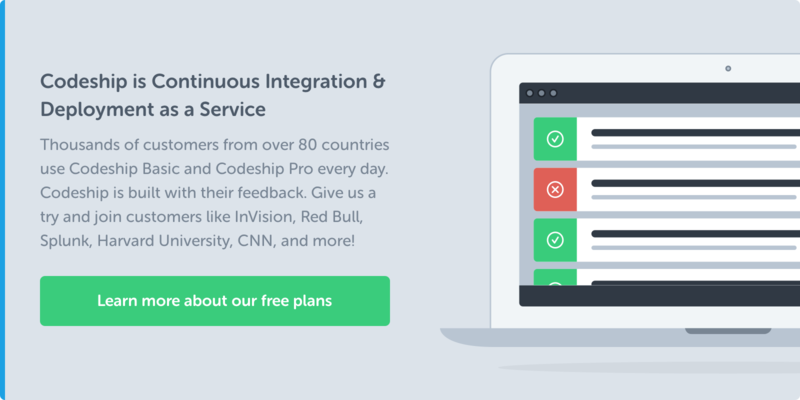 Codeship just released a CLI tool called Jet to test your service locally and in the cloud. Follow this instruction and guide to Codeship Docker infrastructure to get Jet installed. Jet needs a service configuration file called codeship-service.yml. It looks almost the same as docker-compose.yml with a couple of exceptions. # little addition to get the secrets in! If you want to know about encrypted secrets and environment variables (and you should if you want to prevent security breaches), read this tutorial on how to use encrypted environment variables with Codeship. When the test hits green, we’re ready to get the real magic in. Follow the steps for creating a project on the Codeship Docker infrastructure, and automagically, a GitHub webhook triggers the tests. But wait. You bragged about running this thing in production. So let’s throw in some more magic. Check the last step called redeploy_step. If you’re not familiar with Cloud 66, the service simplifies Ops for developers by building, configuring, and managing your servers on any cloud. Our Docker support provides a complete toolset for rolling out containers to production on your own infrastructure. We only need this very simple service.yml to run the whole thing in a real Docker production environment. With the service.yml, you can do a lot of cool things to get the most out of your service. Okay. Hold on. You checked all the source code on our GitHub repo. But what if you’re not into Node.js but more of a Ruby person? How can you start using the workflow right away? We have a Starter project just for that. Cloud 66 Starter is an open-source command line tool to generate a Dockerfile, docker-compose.yml, and a service.yml file from arbitrary source code. The service.yml file is a Cloud 66 service definition file, which is used to define the service configurations on a stack. So let’s go back to where it all starts from again, because I can hear you asking: How do I run Docker in production? Let me tell you. Register with Cloud 66, dial in with the credentials of your cloud provider of choice, and begin using the UI to start a Docker stack. Pop in the service.yml and off you go! Grab a coffee and sit back to get those servers provisioned. So you want scale? Right then. You can scale vertically to add more Docker servers to your cluster to scale horizontally and spawn more containers running the API image. You’re working hard on your API, so run the test (green! yeah!) and tell Cloud 66 to redeploy the running services. Let’s add a redeploy hook to Codeship and trigger that event at Cloud 66. The script needs an environment variable called CLOUD_66_REDEPLOY_HOOK. How do you get one? Once you’ve deployed your stack with Cloud 66, you’ll see a Redeployment Hook URL on your Stack Information page. To trigger a new deployment via Codeship, simply use the example notifier service (based on the ultra small alpine base image) to the last project step. With the integration of Codeship and Cloud 66, you get an easy-to-use and fast Docker workflow pipeline, and you don’t have to worry about running Docker in production. Let Codeship take care of all the (integration) testing and don’t worry about your Docker cluster; Cloud 66 has got your back. If you have a Philips Hue hanging in your office, check out this script to get some fancy red/green lights in your office during tests and deployments! PS: You can also deploy to Cloud66 without using Docker. Check out this article on deploying to Cloud66 in the Codeship documentation.